Are you working here for the season and free from 9h-11h or 16h-18h? Or maybe you are a non-skier visiting Morzine with family and friends on a skiing holiday? Or perhaps you fancy improving your French and would like to visit Morzine and combine this with a skiing holiday? If so, then check out Alpine French School’s Winter French Intensive Courses. We run French Intensive Courses throughout the winter season from 9h-11h and 16h-18h Monday to Friday. We run several classes to cater for all levels of French from beginner to advanced. All of our courses are taught by native-speaker French teachers who bring their wealth of teaching experience to make sure you get the most from your course. They all speak English to help with any complicated grammar explanations or to answer any questions you may be unable to ask in French if you are a beginner or elementary level. You can read more about our teachers here. 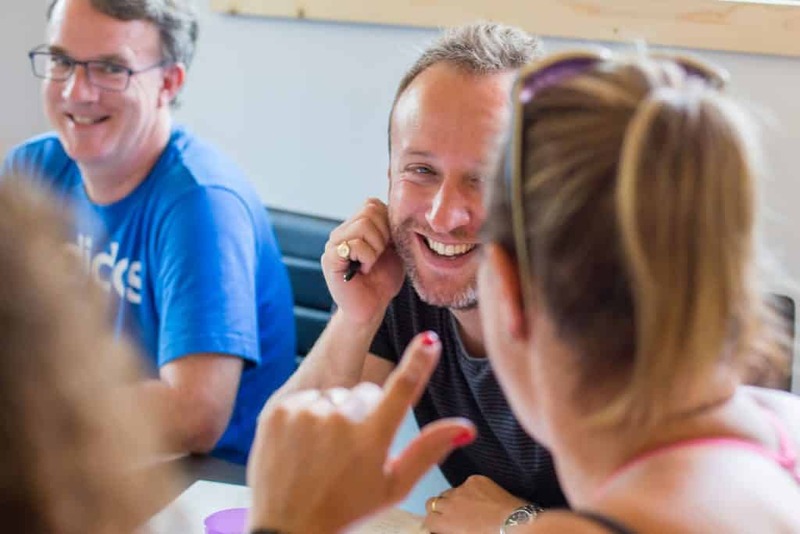 Our French Intensive Courses focus on speaking and listening skills and practicing using your French in practical situations. You will also learn new vocabulary and work on your pronunciation to help you express yourself in French effectively. You will notice a real boost in your French in just one week! Our other students are a mixture of ages and nationalities. Some come to visit the French Alps to learn French on a French and Skiing course, some are non-skiers visiting with family and friends on a skiing holiday, while others are staying in Morzine for the season. Our students are generally a sociable, motivated bunch who enjoy meeting other students and having fun on and off the slopes as well as improving their French. We moved to our new premises in summer 2018, so come and enjoy our bright airy classrooms, meet some new people and improve your French at the same time!